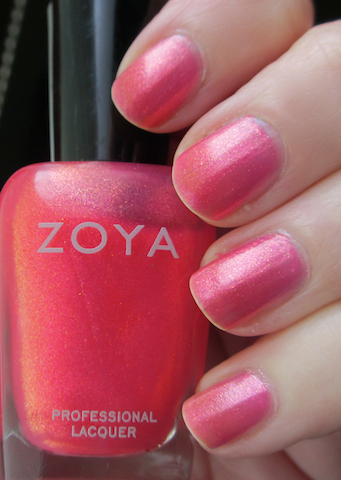 Zoya Belle is from Zoya's Limited Edition Blogger Collection. The collection is available through Birchbox and was inspired by 3 bloggers. The reason I have this is because I won a give-a-way sponsored by Eleventh Gorgeous, who created Coraline. The creator of Belle, the shade above, was Capital Hill Style. This is described as a coppery pink with features of microscopic bits of iridescent glitter. The color reminds me of a watermelon. This is 3 coats - it's sheer, but it's suppose to be:) I happen to have a dupe in my collection and I will post a pic in my next post.